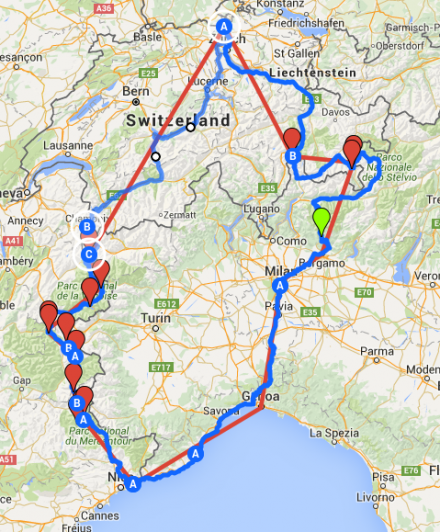 A new TWIKE adventure in 2016! After pushing our limits during our last year’s adventure, TDB2015, TDAF2016 will concentrate on the nicer sides of TWIKEing: crossing mountain passes and driving along coastal roads. We’re both really looking forward to travelling to the French Alps and the Ligurian Coast. We’ve both not been in a while and we’re going to able to cross off some of the missing passes in Europe from TW560’s list. With TW560’s new 52Ah battery, we’ll have plenty of electric range (460km+ to be precise) to travel without any charges during the day and have about 2 hours more per day to take in the scenery. Start reading: first TDAF2016 entry with TW560’s 200k anniversary!